After one level you see clearly the inspiration for Paper Munchers. It's a physics puzzle that places a premium on completion in the fewest turns. Ergo, Angry Birds, and why not. It's the ultimate lottery winner in mobile games development. The difference is Angry Birds, though it may require some ridiculously precise shots, at least supports and reflects them in its gameplay. Paper Munchers does not. The end result is a game oscillating between trivially simple levels and maddeningly difficult ones, with no faith that your shot placement matters any more to your success than stupid luck. 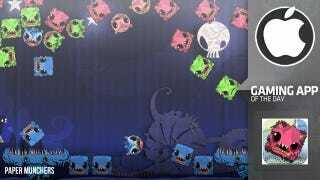 Coupled with a microtransaction framework, Paper Munchers, by Big Blue Bubble for all iOS devices, leaves the impression that it's not going to make its money with gameplay that's better, but with gameplay that's inscrutable. Still, your blast's area of effect is too broad to allow you to place considerate shots to truly optimize your bomb-regeneration. And the floaty trajectories of your paper monster victims make cleaning up those last few stragglers a crapshoot. I suppose this is by design. If you could reliably feed single paper monsters into the correct mouth, you could keep playing the game forever. But instead of balancing the gameplay, the blast physics reduce Paper Munchers to a type of video pachinko. Just hit the plunger and hope for the best, and restart when you run out of tries. I would spend 10 minutes on a single level, often coming up one monster short, and then encounter a level passed in one try with two bombs to spare. And this was deep into the game. Most pernicious, however, is the actual commoditization of your shots. That is, you can pay extra money to get more. While "temporary bombs" may be acquired (through an upgrade screen) with free currency earned at the end of each round, the option of paying $3.99 for a 50-pack of extra shots is always there. You can also go back to the easy levels and grind for more currency to buy more shots. Given how impossible some of the later rounds seemed on the standard three-shot allotment, it's a matter of time before one of these two courses of action becomes necessary. As a 99-cent time killer, sure, you can feed red squares into red jaws and blue squares into blue mouths all day long, building up the credits necessary to, in the next morning's commute, overwhelm the latest level that's giving you trouble. This would have some appeal if the blast physics didn't seem so random and uncontrollable. In the end, you have a game that explores the subtle difference between addictive and compulsory gameplay. In every phase, Paper Munchers seems engineered for the latter.